Two young actors win roles in Welsh feature film | Fourthwall Magazine & The Drama Student – The magazine for careers in the performing arts – actors, drama students, directors, producers, writers, production crew. 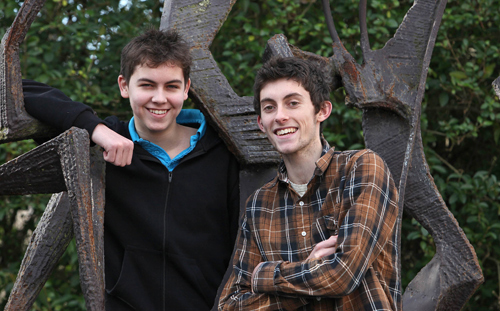 ‘Valleywood' came calling recently for two young actors from Cardiff. Both Carlton and Martin attend the Royal Welsh College of Music and Drama's Young Actors Studio, which provides talented young actors with pre-degree training in acting skills, and also The Workshop, a Cardiff based enterprise specialising in training young actors for the film and television industry. It was through The Workshop's agency, ATSLI Casting Ltd, that both were approached and cast in Ironclad. They joined an army of stars including Oscar nominated Paul Giamatti and the College's own Aneurin Barnard, who graduated in 2008, on set near Cardiff. The filming of the legendary story of the Knights Templar defending Rochester Castle against the tyrannous King John and his army in thirteenth century England, gave the boys the chance to learn their craft first-hand while watching actors they've always admired. Most of the shots were taken just down the road from the studios, based at a former open cast mining site near Cardiff, he reveals. Some of Carlton's filming called on all his acting powers. “I had to stand in front of a green screen and pretend there was a massive army attacking us when really there were only a few actors playing mercenaries. As a king's aide I was holding a banner, and so had no weapons at the battlefront. “It was easy to be terrified. I just went into the zone and got on with it. Although it was tough waking up at five o’clock in the morning and wearing an uncomfortable wig, acting with amazing actors like Paul Giamatti and Charles Dance made it all worth while,” he enthuses. Watching these actors work has inspired me to do everything I can to become as successful as them. Launched in September 2008, the Young Actors Studio's Acting Courses provide an opportunity for talented young actors to prepare for training at degree level and Theatre Workshop provides any young person, regardless of whether or not they intend to train for a career in theatre, with an opportunity to develop their creative and life skills. “YAS was set up for young people who are passionate about theatre and drama,” says Erica Eirian, actor, director and the Young Actors Studio Co-ordinator. “Our Acting Courses provide talented young actors with an insight into full-time training and an opportunity to develop and improve their Acting, Voice and Movement skills. Our Theatre Workshop provides classes for young people of all abilities and an opportunity to develop their creative and personal skills. Young Actors Studio is auditioning in March for places on the 2010/11 one year Acting Courses. YAS Theatre Workshop is open for admission throughout the year.